Foam or powder extinguisher, which one to choose? We get asked regularly about the advantages of foam extinguishers versus powder extinguishers. Both extinguisher types have pros and cons for their use. To start with it is important to know which type of fire you are most likely to have to tackle with your fire extinguishers before you can make a considered decision. The environment (type of building, room size) and the likely user are also important. Foam extinguishers are suitable for class A (wood, paper, upholstery) and class B (petrol, liquifying plastic, paints) fires. The foam forms a blanket on the burning material, starving the fire of oxygen. Foam extinguishers also soak into the materials that are alight, which roots out deeper seated ambers. The water content of the foam evaporates in the heat of the fire and cools the fire down, preventing re-ignition. The jet of the foam targets only a small area, making the clean up easier than with a powder extinguisher. Due to the properties of the foam extinguishing agent there is also no risk of inhalation in confined spaces. However, it is worth keeping in mind that most foam fire extinguishers are carcinogenic, so a thorough clean up after use is important. You will require a larger extinguisher to fight a fire with foam rather than with a powder extinguisher. Foam extinguisher can not be used on gas fires. Powder extinguishers not only fight class A and B class fires, they can also be used on class C fires (caused by combustion of gasses such as natural gas, propane, hydrogen). 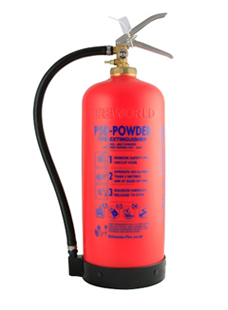 A powder extinguisher is suitable for a broad range of fires. The powder does not soak into the burning material and does not evaporate to cool the fire. Instead it ‘knocks out’ the fire and forms a blanket or crust over the fire to starve the fire of oxygen. They are a more powerful extinguisher than their foam counterparts and the physical size can therefore be smaller than a foam extinguisher for the same application. However, there are disadvantages. When deploying a powder extinguisher there is a lot of mess to clear up! The powder can be inhaled and care must be taken when they are used. This type of extinguisher leaves a lot of residue behind and is therefore not necessarily suitable to use in areas where food is prepared. The powder will also damage soft furnishing such as carpets, curtains and settees if not totally removed. Powder extinguishers should ideally not be installed where children can reach the extinguisher, or where vandalism is possible. Care has also to be taken in historic buildings, as the powder can damage wood and surfaces. Powders are ideal in garages, cars, industrial settings, workshops, while foams are ideal in areas with soft furnishing and areas of public traffic. For a more detailed comparison visit our extinguisher advice section. Powder fire extinguishers cover everything in a fine white powder when discharged in a building and most AFFF foam extinguishers contain a slightly carcinogenic chemical. So how do you clean up safely after an extinguisher discharge? We have created a short help guide explaining how to clean up after the use of a powder or foam fire extinguisher .